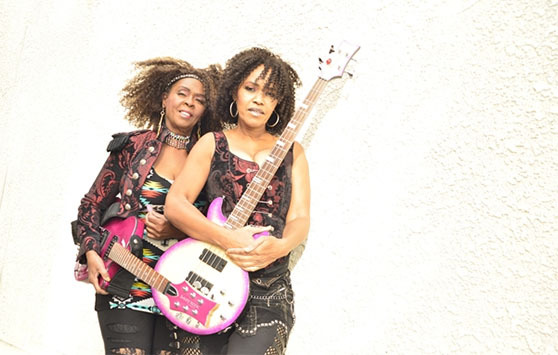 Formerly the Back Up Band for MC Hammer, Sisters Guitar Sallye & Tamah have toured worldwide, working with Prince/Levi Seacer, The Roots/Cody Chesnutt, Bootsy Collins, Charlie Wilson and their Nu Family Band! After opening a SCHOOL OF MUSIC in CHICAGO’S ROBERT TAYLOR HOMES. the sisters picked up the Bass and Guitar and began to create a Unique Musical Expression of themselves. Recently crowned “the BOOTSY GIRLS by the legendary BOOTSY COLLINS in 2011, the B Girls have Hit the Road. (As Co founders of the B Girls Movement. Sallye & Tamah have always had a passion to help lift the self esteem of women and young girls!) This honor was not only musical, Because now, Gtr Sallye and Tamah have co-writtened with BOOTSY & AL SHARPTON, (JB STILL the MAN), on BOOTSY’S newly released album, (which is # 1 on LONDON Radio). Gtr Sallye & Tamah/aka B Girls continue to tour, and Support their HOUSE OF BIGGER GIRLS Program, while Spreading their Message thru their Music!.